Whatever the local gossip-mongers may say, none of us Gilflurts has ever had cause to be shipped off to the New World, it's a scurrilous falsehood. In fact, our only connection to the colonies is the odd tea we took with Major-General Brisbane when he came to call on our elder uncle Gilflurt. Born in Ayrshire, Brisbane studied mathematics and astronomy at the University of Edinburgh before joining the 38th Regiment of Foot. His military career took him around the world and under the watchful eye of the Duke of Wellington, he rose swiftly through the ranks and was awarded a number of commendations. With the Iron Duke's support he was appointed Governor of New South Wales in 1821 and for his four years in office, was a keen and ambitious reformer. The first President of the Philosophical Society of Australasia, Brisbane set up Australia's first observatory as well as academic agricultural institutions; he also pioneered the sowing of a number of valuable crops in the area. In 1823 Brisbane championed the building of a new convict settlement at Moreton Bay; this settlement was named after him and by 1839 was a free town. Though his policies found favour with the public, Brisbane clashed with Colonial Secretary, Frederick Goulburn, who was highly critical of some of his decisions. Like those who had taken the office of Governor before him, he found himself at odds with other administrative officers in the region and their complaints against him were enough to trigger an official inquest into his behaviour. 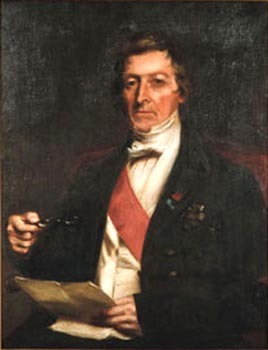 Although he was eventually absolved of all the accusations, both Brisbane and Goulburn were recalled to England in December 1824 by Earl Bathurst, Secretary of State for War and the Colonies. Brisbane left Australia immediately, retiring into life as a Scottish country gentleman. With his passion for science, he was an eminently suitable candidate for the role of President of the Royal Society of Edinburgh in 1832 (1832) and turned down several high government offices abroad to continue his astronomical work. Further laurels followed with honorary degrees from Oxford and Cambridge, a gold medal from the Royal Astronomical Society and fellowships of both the London and Edinburgh Royal Societies. His research was invaluable to the field of astronomy and he published a number of works on the subject. Brisbane died in 1860 and was buried in the Brisbane Aisle Vault; the convict settlement that took his name is now home to more than two million inhabitants and a State capital... not bad for a boy from Largs! The graveyard where Brisbane is buried is pretty near to where I live. It's well worth a visit, there are many old and notable grave stones there. It sits hidden away in the middle of Largs, right next to Skelmorlie Aisle, which houses the tomb of Sir Hugh Montgomerie who fought for Scotland at the Battle of Otterburn. It's definitely a very interesting place for anyone interested in local (and international) history. It's on my long list of *must visits*! I don't think I've visited the Brisbane Aisle - where exactly is it in Largs? I have visited the Skelmorlie Aisle with its painted roof and that's well worth a visit. It's in the grounds of the Largs Old Kirk, which is off Largs Main Street!